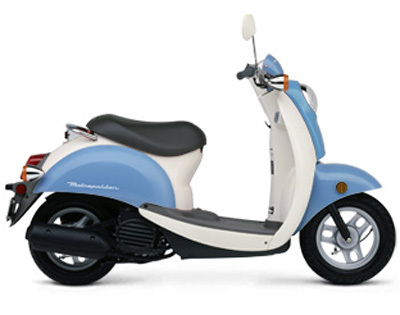 I just got a look at the new Metropolitan I'll be riding and it's a beautiful light blue and pearl white (http://www.dsquared.org/cars/2003_1metrosky.jpg). Soon after, a thought crossed my mind: The traditional black helmet would look terrible against this. I feel like finding a helmet that matches my scooter is very important. It's going to be difficult to find a medium helmet that's the same blue color as my scooter. I wouldn't mind having a Pearl White helmet either. Anyone got any advice on where to find a helmet like this or perhaps your opinion on which color you think would compliment my new ride? Thanks a lot! Maybe something like the blue flamed one here. Black is also the worst color for visibility. White or mostly white seems the most visible. I have the orange version of this helmet for my Juice (orange) colored Met. The blue might look good with your blue Met. I am happy with the helmet. I like the sort of retro look and it fits me well. Wearing a beanie type helmet is not much protection. Please don't risk safety in order to match your scooter. HJC makes many style helmets in a pearl white color-- 3/4, modular & full face all are safer choices than the beanie helmets. You can choose a helmet having same color as that of your scooter. I would like to suggest a site Full Face Motorcycle Helmets where you can find different model of helmet such as artic white, black moon, red passion, Grey reflex, magnetic blue and many more to fit your choice. I have the older generation of this helmet in silver, love it! Anyone know where I could purchase a full faced pearl white & red helmet to match my Honda Jazz?